Solid heavy design for a perfect pairing with Controlled Automation CNC drilling and punching lines. The largest heavy duty miter saw (60º both directions) specifically for the structural steel fabrication industry. Features on this saw are designed with the fabricator in mind such as a robust heavy design of over 18,000lbs, a 10º blade cant, 2-5/8" (67mm) blade size and a large specially designed planetary gearbox. 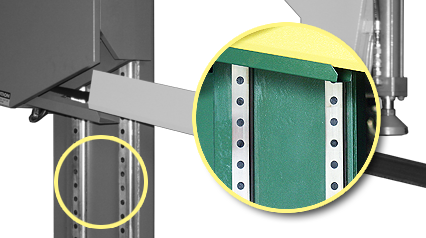 The two vertical linear guide columns from left and right combine with horizontal cross links to form a solid box frame. This structural design enables an extremely steady and sound saw bow movement and enhances your cutting precision. 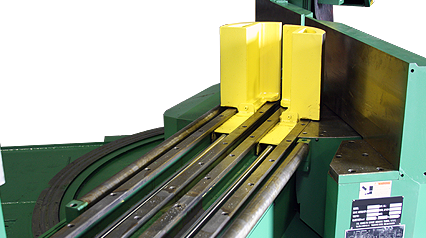 A total of four saw bow linear guides allow a smooth pulse-free up and down movement of the hydraulically driven saw bow. Our specially designed planetary gearbox provides smooth and powerful cutting through the heaviest of materials. 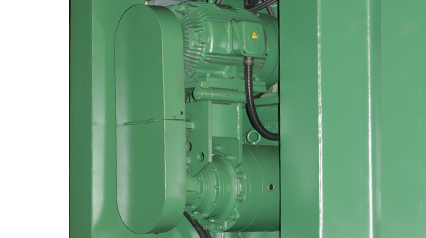 The power transmission efficiency is higher than 90%, topping all other gearbox types in mechanical performance. Also, it accepts more pressure during operation and will not create thermal distortion, providing long gearbox life under various production conditions. Over time, our customers realize significant savings in energy cost and increased productivity. 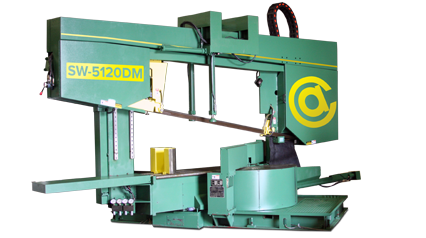 Controlled Automation's SW-5120DM allows users to swivel to 60 degree both forward and backward, making your cutting jobs even more versatile and helpful when handling various miter-cutting jobs. The dual vertical vises work independantely clamping material on both sides of the blade, and positively grip the material at any miter angle. The standard plunger-style overhead clamp reduces cutting vibration on large structural shapes and improves cutting accuracy. 2-5/8" BladeOur larger 2-5/8" (67mm) band saw blade is powerd with a 20hp motor for faster accurate cuts beyond most heavy structural saws. Automatic Saw MeasuringAn optional Saw Measuring system is available combined with a Controlled Automation rack & pinion probe system using Miter Multing through SICAM software for the best in material utilization and inventory feedback. Large Diameter Cast Band WheelsOur exceptionally large diameter band wheels used are of a hardend casting to provide unsurpassed band wheel life and extended blade life. 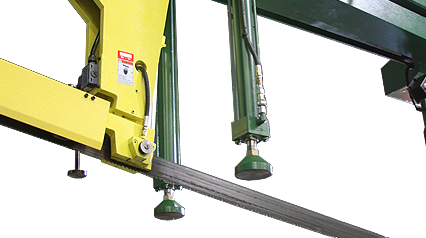 Standard Shadow or Laser LightStandard on a Controlled Automation saw is the shadow-light system for operator assisted allignment or as an option, the laser line system. Chip BrushThe standard Chip Brush runs simultaneously with the saw blade thoroughly cleaning the saw blade gullet, preventing tooth strippage and reduces maintnenace costs. Blade Guide ClampingBlade guides provide the optimum clamping force to maintain proper blade alignment to remove twist and improve blade life. Extreme Horse-PowerCompare the best with the rest and you will find Controlled Automation offers the biggest and best rated system overall for capacity and raw 20 horse-power motor as standard to get you cutting extremely fast.